It was the old Mountaineers bait and switch trick that Glen Strachan pulled out of his leader's hat at the trailhead for Easy Pass. He was apparently saving himself for a trip to Scotland and needed the rest so he asked me if I would take the reigns for the 7-mile, 3,000' gain hike to (not so) Easy Pass. My fellow hikers were Frank, whom I hadn't seen since the Mntrs trip to Iceland in 2000 and glad to see he was still active in the club and Becky, who was a small, compact woman of hidden age and strength.We set off from the trailhead, climbing solidly from the beginning, getting right to task of gaining of 3,000 feet. I was happy to see that we did not have to ford Granite Creek, as my map from 1985 indicated. 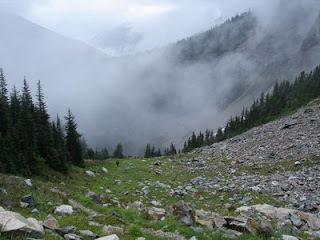 There was a trail sign that the Skagit Alpine Club was maintaining the trail so we have them to thank. whistles and a game of hide-and-seek. The clouds rolled in and out while we enjoyed our lunch but I managed to photo Fisher Valley below and Fisher Peak above. The geologist in our group said that the black rocky peak to our left was known as the "Wandering Batholith" and was thought to have origins in South America, having pushed up through the earth's mantel. 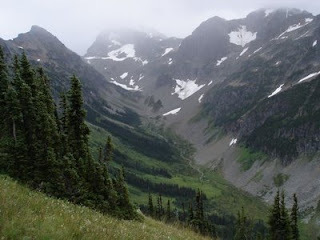 Although this hike is not easy, as the name may suggest, I highly recommend it for challenge and high alpine scenery. And no bugs!